The start of a new year can be the perfect time to re-evaluate your approach to caregiving. What’s working. What’s not. Maybe you’re burning the candle at both ends, managing your own children and the care of your aging parent. Maybe your elderly parent’s challenging behavior is becoming a source of increasing stress for you. Maybe the resentment cloud is rearing its ugly head and you’re ready to make a new start, use new strategies, take a different approach. 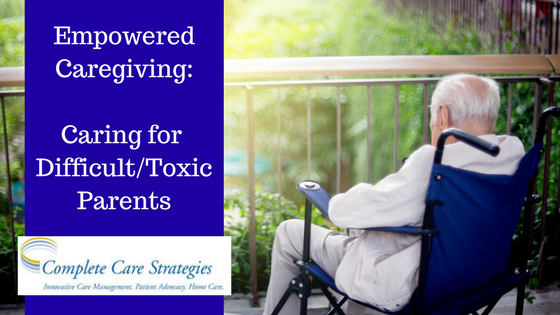 Caring for a dysfunctional parent with increasingly difficult, toxic, even abusive behavior is a challenging situation for any family caregiver. It can breed resentment, stress, withdrawal. And, at the same time, make you feel helpless, frustrated and ultimately, conflicted. In the new year, resolve to take a healthier approach to caregiving. Over time, every little thing that a difficult parent does can drive you up a wall. Recognize that there are situations, behaviors that can be tolerated and are less urgent than others. Reserve your energy for the truly important needs of your parent. Don’t nitpick. Let some of the small stuff slide. Stubborn parents can fight you at every turn. Many times, it is easier for strangers to get parents to comply with requests that they typically reject from loved ones. Senior care professionals, whether in-home caregivers or geriatric care managers, are just that, professionals! Their job to fulfill a need for your parent and take the pressure off of you. Give yourself a break! It’s not unusual to feel a range of conflicting emotions, including resentment, guilt, nostalgia, even anger, when caring for difficult parents. Take time to recognize what you’re feeling and how it relates to the present situation. How can you process and deal your emotions in order to break harmful cycles? Caregiving is emotionally taxing work. Caregiving for a difficult, toxic or even abusive parent requires some pretty thick skin. Your loved one’s behavior could become more extreme due to advanced age, dementia or life-long of mental health issues. It’s important to brace yourself with the knowledge that your loved one is ill. The illness is causing their behavior, at least to some extent. It, likely, has very little to do with you but more to do with their current situation and their inability to control it, manage it themselves. Stay calm, cool, consistent and resist the urge to take it personally. Making self-care a priority is one of the first rules of caregiving. Caring for a loved one can be both physically and emotionally exhausting on its own. When a caregiver is trying to juggle the needs of their aging parent with the needs of their own children, husband, work…their own needs can often be overlooked. Take time for yourself, meditate, exercise, read, take a walk, take time off, ask for help when you need it. Your needs are a priority. You can’t care for anyone else if you are not caring for yourself. At Complete Care Strategies, we know that each family has its own set of unique needs, resources and emotions. As a neutral party, we can serve as an unbiased counselor and help resolve differing points of view. Our clients tell us that they receive support, care, information and peace of mind from the very first call. If you need help managing care for a loved one, we can help. Call our aging life care managers toll-free at 1-888-433-0040.